The importance of the church in the history of African-Americans in the United States is undeniable. 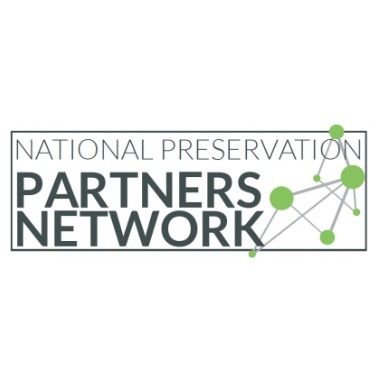 This institution historically has provided vital support and direction in the development and strengthening of African-American communities for centuries; from the time of the original thirteen colonies through desegregation and the Civil Rights struggle. The black church has played a key role in the political, social, and economic presence of African-Americans within this country. The spread of Christianity among blacks in America was inconsistent. In the South, it was feared that exposure to the religion would encourage slaves to press for individual literacy and liberty. The ability of black slaves to freely assemble for worship was prohibited and the religious education of slaves was often designed to reinforce black servitude as divinely ordained. In the North, free blacks were able to establish churches to provide education and job opportunities for African-Americans and use these organizations for political and social action. These northern churches would provide a platform for the abolitionist movement leading towards the Civil War and Emancipation, as well as provide a supportive framework for blacks later during the years of the Great Migration, and invaluable power to the Civil Rights movement in the 1950s and 1960s. In Cleveland, The church became increasingly important as Cleveland’s population swelled in the first half of the twentieth century. 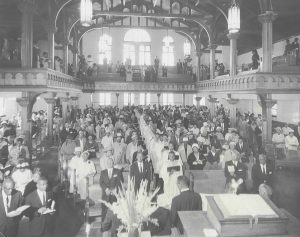 As the population of African-Americans in Cleveland grew, churches provided crucial social services and became ever more important landmarks within their communities. The history of the Central area, annexed by Cleveland in 1873, includes Jewish, Italian, German, Hungarian and Czech immigrants. Before World War I, the community was fairly integrated. Central’s transition to a predominantly African-American neighborhood occurred during the Great Migration. 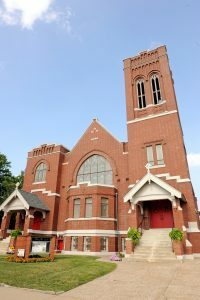 As the African-American population in Central swelled, congregations not only built new churches but also purchased existing religious buildings (look for a future Know Our Heritage email focusing on sacred landmarks originally built for Jewish congregations that were repurposed as African-American churches). There are many sacred landmarks in the Central neighborhood that have played an important role in the history of the African-American experience in Cleveland. The locally and nationally landmarked St. John African Methodist Episcopal Church can be found at 2261 E. 40th Street. Designed by Sidney Badgley and William Nicklas and completed in 1908, this church building houses the oldest African-American congregation in Cleveland. From its location in the heart of the Central neighborhood, St. John A. M. E. has hosted speakers such as Booker T. Washington and W. E. B. Du Bois and singer Marian Anderson for her first Cleveland concert in 1919. Originally built as First Church of Christ, Scientist, Lane Metropolitan Christian Methodist Episcopal Church is sited across the street from the Phillis Wheatley Association’s Emeritus House, at 2131 E. 46th Street (at the corner of E. 46th Street and Cedar Avenue). This Neoclassical church, designed by George Hammond and built in 1900, features an exterior massing that is similar to the Pantheon in Rome. The congregation of Lane Metropolitan C. M. E. purchased the building in 1919, and remains there today. One of the church’s former pastors was Rev. Anzo Montgomery, who, prior to coming to Cleveland, had joined with other clergy in Topeka, Kansas in challenging segregation in schools. This had eventually resulted in the 1954 landmark Supreme Court case Brown v. Board of Education. Lane Metropolitan C. M. E. has been designated a Cleveland Landmark. The congregation of St. Andrew’s Episcopal Church was founded in 1890 as a mission of Trinity Episcopal Cathedral. The church’s current home, located at 2171 E. 49th Street, is a Gothic Revival style building designed by architect Charles Schneider and completed in 1916. It has been designated a Cleveland Landmark. 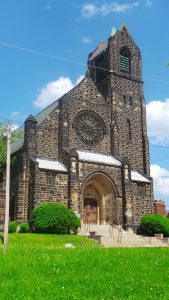 St. Andrew’s was the first recognized African-American Episcopal congregation in Cleveland, with a prosperous parish that included members such as inventor Garrett Morgan and politician John Patterson Green, the “Father of Labor Day”. The parish has a long history of involvement in civil rights. In 1922, St. Andrew’s was the host for the national convention of the Colored Workers of the Episcopal Church. In 1991, the pastor of St. Andrew’s wrote legislation that created a scholarship program to address racism with the denomination nationwide. St. Philip’s Christian Church, 2303 E. 30th Street, was designed by architect Frederick S. Toguchi and completed in 1968. 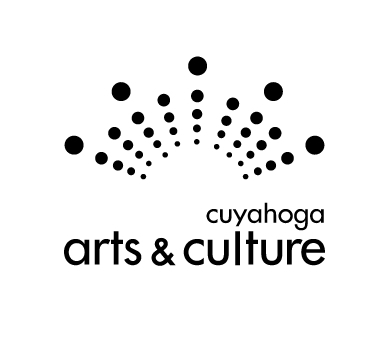 Toguchi, who won the Cleveland Arts Prize in 1965, was a Modernist architect. 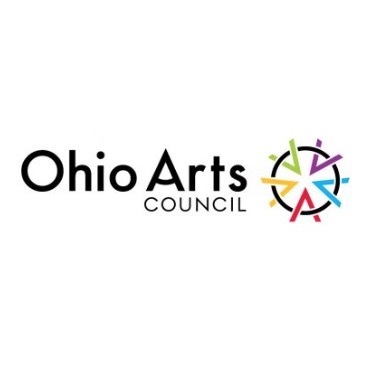 His other projects include Burke Lakefront Airport Terminal and Tower, the Frank J. Lausche State Office Building, Lakewood’s Beck Center for the Performing Arts, and Lakeland Community College. Toguchi’s design for St. Philip’s, located near Cuyahoga Community College’s Metro Campus and the Cedar Apartments public housing project, has created a church unlike any other in the city. St. Philip’s, which has been designated a Cleveland Landmark, has little ornamentation because its small, poor congregation felt that their work was focused on the outside of the church, rather than inside its four walls. The building itself has been created using precast concrete panels. Fairfax refers to a section of Cleveland that was previously part of the Central neighborhood. 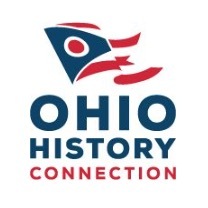 As in Central, Fairfax saw population growth during the first half of the twentieth century, as African-Americans settled there with the influx of newcomers to Cleveland during the Great Migration. However, both neighborhoods experienced dramatic decreases in population during the second half of the century. One religious denomination that found a home in Fairfax was the Baptists. Cleveland’s second oldest congregation and first African-American Baptist church was Shiloh Baptist Church, founded in 1849. In 1893, part of Shiloh’s congregation separated and formed Antioch Baptist Church, which was the second African-American Baptist church in Cleveland. Antioch grew to become the city’s largest black church in the early twentieth century, having 1,200 members in 1923. The church, at 8869 Cedar Avenue, was completed in 1892 as Bolton Avenue Presbyterian Church. The Romanesque Revival style building, designed by architect William Warren Sabin, was purchased by the Baptist congregation in 1934. A very active church, Antioch has offered many programs to assist the community throughout the years, including the first faith-based AIDS program in Ohio. It has its own credit union and a twelve-story apartment building. Important speakers, including Dr. Martin Luther King, Jr., have been in Antioch’s pulpit. The church has been designated a Cleveland Landmark. Construction on Emmanuel Baptist Church, built after a fire destroyed the first home of the congregation, began in 1940 and the church was dedicated in 1949. Located at 7901 Quincy Avenue, it was the first Baptist church in Cleveland to be built to completion by an African-American congregation. The church has had a steady and committed membership. For a span of forty years, from 1966 to 2006, the congregation was led by Rev. Sterling Glover. Emmanuel Baptist Church continues to provide services and programs to its Fairfax community. 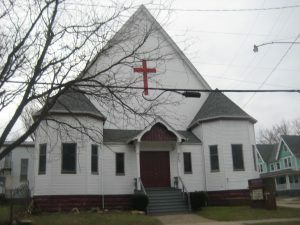 The Olivet Institutional Baptist Church, 8712 Quincy Avenue, has roots in the Olivet Baptist Church of 1884 and has been recognized for its important role in Cleveland’s African-American community. The church building, completed in 1954, is traditional but simple. Reverend Martin Luther King, Jr. used Olivet as a base of operations for his work in Cleveland. The pulpit has also hosted Coretta Scott King, Jimmy Carter, Jesse Jackson, Al Sharpton, Tavis Smiley, Oprah Winfrey, Bill Clinton, Hilary Clinton, and Al Gore. The roots of the congregation can be traced to Cleveland’s Triedstone Baptist Church. In 1931, members of that church decided to split from their church and formed what they called New Light Baptist Church (which met at the former Temple Tifereth Israel, now known as Friendship Baptist Church at 5600 Central Avenue). Eventually that church became Olivet Institutional Baptist Church and built its current home on Quincy. Under the leadership of Dr. Otis Moss Jr., who is known for his connection to both Martin Luther King, Sr. and Martin Luther King, Jr. and his work to advance Civil Rights, Olivet Institutional Baptist Church became the largest African-American church in the state of Ohio. Serving a congregation founded in 1894, St. James African Methodist Episcopal Church at 8401 Cedar Avenue is one of Cleveland’s leading black churches. In 1926, with a congregation of more than 500 individuals, St. James A. M. E. purchased the sacred landmark that had been known as Trinity Congregational Church. 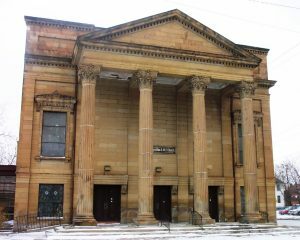 Despite fires in the 1930s and 1950s, the congregation has remained in this Richardsonian Romanesque building since 1926. The church is known for its activism in promoting civil rights and for its community involvement. The parish of St. Adalbert, a rare Catholic African-American church, was originally established to serve Bohemian (Czech) Catholics. The Romanesque style church of St. Adalbert, located at 2345 E. 83rd Street, was designed by architect William P. Ginther and completed in 1911. 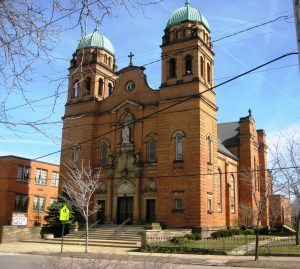 Established in 1922, Our Lady of the Blessed Sacrament, a neighboring parish to St. Adalbert, was the first African-American parish in the Diocese of Cleveland. Our Lady of the Blessed Sacrament grew steadily and offered many services and activities for parishioners and the greater community, including a credit union, vocational training programs and youth programs. By the 1960s, St. Adalbert’s membership had dwindled while concurrently the church of Our Lady of the Blessed Sacrament was in need of expensive rehabilitation. The decision was made to combine the two parishes at St. Adalbert and Our Lady of the Blessed Sacrament’s large African-American congregation moved to St. Adalbert in 1961. A Cleveland Landmark, the church was closed by Bishop Richard Lennon of the Diocese in 2009, however the Vatican ordered that the church be reopened in 2012. African-Americans living in Cleveland could choose from a number of denominations in order to meet their spiritual needs. These churches provided critical services not only to their congregations, but also to the greater community by offering programs for all ages, including their own credit unions and housing development. Some churches have taken a more activist role in advancing civil and social justice agendas. All churches have a place in the heritage of the African-American Experience in Cleveland. The home of the congregation of Fellowship Missionary Baptist Church was originally built as Grace Lutheran Church in 1908. The brick and stone Gothic Revival building, at 1754 E. 55th Street, was designed by Cleveland architects Bohnard and Parsson. The congregation of Fellowship Missionary Baptist was the sixth to come out of Shiloh Baptist Church, the oldest African-American Baptist Church in Cleveland. Fidelity Baptist Church, at 8402 Wade Park Avenue, is an impressive example of Gothic Revival in wood. The church is architect Sidney Badgley’s only existing frame building in Cleveland. According to permits, the building was constructed in 1891. It is an Akron Plan church, with its sanctuary on an angle. East Mount Zion Baptist Church is located at 9990 Euclid Avenue, the southwest corner of E. 100th Street and Euclid Avenue. 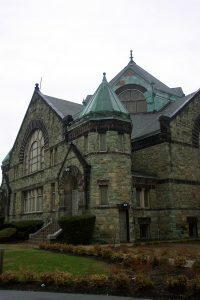 The building, designed by George Kramer and completed in 1908, also follows the Akron Plan of church layout. The congregation of East Mount Zion Baptist Church purchased this building from Euclid Avenue Christian Church (a congregation of the Disciples of Christ) in 1955, and became the first African-American church to hold its services on Euclid Avenue. The exterior of East Mount Zion Baptist has a unique facing of green serpentinite stone, which comes from Chester County in southeastern Pennsylvania. Although the building housing Mt. Zion Congregational Church is modern, the congregation itself is one of the oldest African-American congregations in Cleveland. In 1864, a small group from Shiloh Baptist Church organized the first African-American Congregational church east of the Mississippi River. The congregation met in various place until the 1950s, when a decision was made to construct a home at 10723 Magnolia Drive. Despite efforts to slow or stop construction, the church was completed in 1955. Mt. Zion Congregational Church has a long history of providing services and resources to the African-American community. For example, the congregation formed the Mt. Zion Congregational Church Lyceum to address community issues and the Christian Business League to promote the development of African-American business in the city. The church also hosted Cleveland’s first African-American Girl Scout troop and programs of the Urban League of Greater Cleveland. Greater Abyssinia Baptist Church, 1161 E 105th Street, has hosted important figures such Hubert Humphrey, vice president under Lyndon B. Johnson and primary author of the Civil Rights Act of 1964, and Reverends Jesse Jackson and Al Sharpton. Cleveland Councilman Rev. E. Theophilus Caviness served as one-time pastor of the church and also held various public and civic positions, including a seat on the Ohio Civil Rights Commission. A former congregant of Greater Abyssinia was Edward Durden, a well-known civil rights activist. The church is the current home of the Cleveland Chapter of the Southern Christian Leadership Conference. Greater Friendship Baptist Church, 12305 Arlington Avenue, was designed by Corbusier, Lenski, and Foster as First Evangelical and Reformed Church. There are three large African-American-themed stained glass windows that illuminate the inside of the church.